UFC Heavyweight Champion Daniel Cormier vs. Brock Lesnar might not happen after all. The UFC has been trying to make a fight between Lesnar and Cormier inside of the Octagon since last July. Cormier was able to score a KO win over Stipe Miocic to win the UFC heavyweight title at UFC 226. Then, things got out of hand. 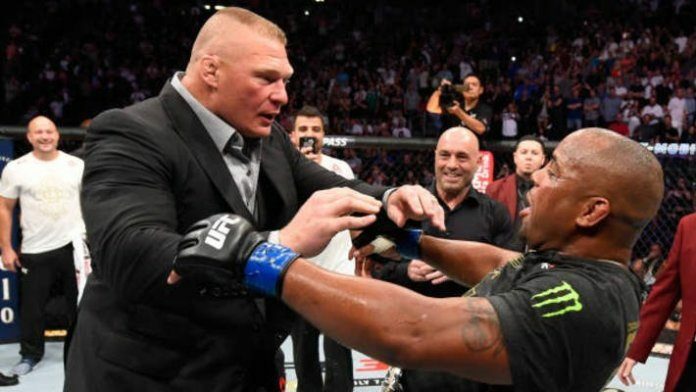 Cormier invited Lesnar inside the Octagon with Lesnar accepting the invitation and shoving Cormier in the process. Lesnar then cut a promo on the heavyweight division and Cormier. It was recently reported by ESPN’s Ariel Helwani that the promotion was hoping to book this fight in August. However, the fight isn’t even in the works according to UFC President Dana White. White gave the impression that nothing is imminent on Friday at a UFC press event in Atlanta. This led to the fans starting to boo. White stated that he doesn’t know if Lesnar will fight again as they don’t have a date with him now. This led to him hinting at having Cormier do a rematch with Miocic instead but will need to wait for Cormier to get healthy enough to fight again. Lesnar’s future with WWE is also in uncertain as he doesn’t have any dates scheduled with the company after losing the Universal Title to Seth Rollins at WrestleMania 35.